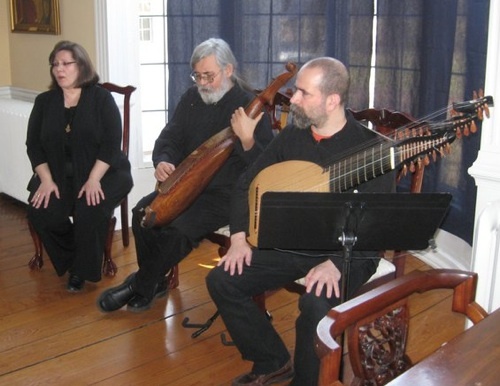 On March 20, 2011, the Ukrainian Historical and Educational Center of NJ presented a concert entitled "Saints and Sinners", performed by the Collegium Musicum of the New York Bandura Ensemble under the musical direction of Julian Kytasty. The performers (Julian Kytasty - voice, bandura, kobzar bandura, recorder; Natalia Honcharenko - voice; Michael Andrec - voice, bandura; Roman Turovsky - baroque lute) presented a program consisting of religious and devotional songs of the Ukrainian Baroque, and the echoes of that repertoire in the oral tradition of the kobzari (the itinerant bards of Ukraine). Prominently featured were the devotional songs of St. Dimitry of Rostov (1651-1709), born Daniel Tuptalo to a Ukrainian kozak family. Although he is best known for his monumental "Lives of the Saints", he was also active as a composer and playwright. Many of his penitential psalms and devotional songs achieved wide circulation, not only in Ukraine, but as far away as the Balkans. Much of the remainder of the program consisted of songs recorded at the turn of the 20th century by folklorist, choral conductor and composer Porfiriy Demutskyj (1860-1927). He was educated at the Kyiv Theological Seminary, where he began to collect folk songs. He became particularly interested in the religious songs of the kobzari and lirnyky (players of the "lira" or Ukrainian hurdy-gurdy). In 1907, his collection "The Lira and Its Melodies" presented this repertoire for the first time in published form without attempting to force them into the mold of Western Classical music. The concert took place in the refectory of the St. Sophia Ukrainian Orthodox Seminary to an enthusiastic standing-room audience. Present were Bishop Daniel, members of the local community, and Ukrainian-Americans from as far away as Whippany and eastern Pennsylvania. Following the concert program Natalia Honcharenko – interim director of the Patriarch Mstyslav Ukrainian Heritage Museum expressed her gratitude to those in presence for their participation in the afternoon concert and invited everyone to share in a social hour at which people had an opportunity to find out more about the programs of the museum as well as the progress of the construction of the Patriarch Mstyslav Ukrainian Heritage Museum as part of the Ukrainian Historical and Educational Center of NJ.